Charges have been filed against the man who police say pulled out a gun inside a classroom at the Community College of Philadelphia. CENTER CITY (WPVI) -- Charges have been filed against the man who police say displayed a gun in a threatening manner during an argument inside a classroom at the Community College of Philadelphia. 23-year-old Ryan Fitch was arraigned Thursday afternoon, charged with Bringing a Weapon in School, Terroristic Threats, Simple Assault, and Recklessly Endangering another Person. Fitch posted 10 percent of his $250,000 bail, allowing him to be released early Thursday evening. His preliminary hearing is scheduled for June 13th. Fitch was taken into custody after 2:00 p.m. Wednesday at his apartment building in the 9500 block of State Road in Northeast Philadelphia. Action News learned Fitch does have a license to carry a gun. Sources said a gun was recovered in his vehicle, which was towed away by police. During the Thursday's arraignment, an attorney for Fitch claimed that his client never pulled the weapon inside the school, but that the gun was observed on his waist. It was Wednesday afternoon when police put out a description of Fitch and his vehicle, shortly after students reported seeing him with a gun inside a classroom at the West Building on the CCP campus. "I was scared because I've never been through a situation like this before so I didn't know what was going to happen," student David Fowler said. Fowler and his classmates were in chemistry class shortly before 12:00 p.m. when witnesses say Fitch walked in. "One of the students in class came in and started arguing with another student. He pulled out a gun on the other student and everyone ran out of the classroom," Fowler said. Pictures from incident at Community College of Phila. 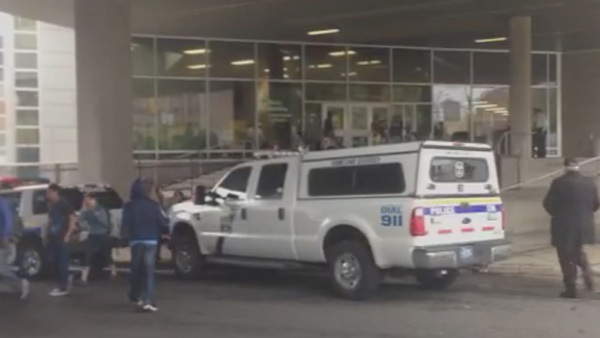 Police were called to the Community College of Philadelphia Wednesday after a report of a person with a weapon. Frantic students called 911 while others ran for cover. Philadelphia police entered the four-story building on the urban campus in the Spring Garden section. Hundreds of students and staff were evacuated as officers systematically cleared floors and classrooms for more than 30 minutes. Police are still questioning witnesses, trying to sort out what exactly happened. On Wednesday evening, the young woman at the center of the argument was questioned at Central Detectives. The suspect's mother Tricia says she spoke to her son shortly after the incident. She told Action News over the phone that it was all a misunderstanding and that her son felt disrespected during the dispute. She added that her son has never been in trouble with police before. Meanwhile, the main campus of the college closed for the day at 2:15 p.m. but reopened Thursday under normal operating hours. Other schools in the area were placed on a brief lockdown until police gave the all-clear. Students arrived to Community College of Philadelphia in Spring Garden this morning. While some students explain there were some frightening moments and ones of uncertainty yesterday, they say it helps knowing this wasn't a threat on random students. Freshman student Kate Cihanowyz says, "I think it would have been more of a bigger deal and created more chaos if it was an active shooting. But you kind of didn't really know what it was. Did someone just have a gun on them? Was he carrying? It was kind of up in the air." Nora Tramontina, who is also a student there, tells us, "I don't think it should be a reflection on the school or anything like that. I just come here for summer classes but I've always felt like it's a pretty safe school."